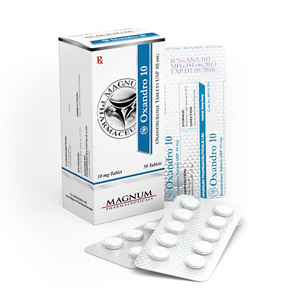 Magnum Oxandro 10 mg (a drug known to many under the brand name ANAVAR), as well as: Vasoreme, Oxandrin and Anatrofill. In bodybuilding, this tool received a slang name from the female name – “Oksana”. This drug is an anabolic steroid, which originally appeared in 1964 under the trademark Anavar. The drug is widely known due to the fact that it has a high level of anabolic activity (approximately 400 percent of testosterone), and at the same time, an extremely low level of androgenic activity (approximately 20 percent of testosterone). The time during which the drug can be detected is no more than 45 days. Increased levels of growth hormone. Note that the use of the course Oxandro 10mg “SOLO” is inappropriate during the recruitment of muscle mass. This tool is recommended for those athletes who have a decent muscle mass and the purpose of which is to burn subcutaneous fat, gain muscle hardness and acquire relief.